Flip This Zombie is the second book in the Living With The Dead series. I haven't had the opportunity to peruse book one as yet, but it is not needed to sink your teeth into this book. 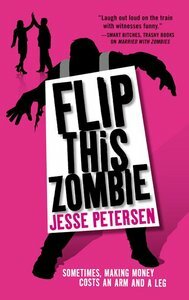 With quips throughout the story to keep you on track in case you did not read the first one, author Jesse Petersen keeps you involved and entertained with humour, horror and humanities desire to survive, no matter what the circumstances. David and Sarah are a husband/wife team who decides to make the best out of a life-altering situation. Zombies are on the loose, the Apocalypse is upon them and their choices are limited. Combining their combat and ingenious weapons skills the two decide to create ZombieBusters, zombie mercenaries who will eradicate your infestation for a price, well, okay so they will settle for a bag of band-aids, but that besides the point. After taking on a client who wants fresh zombies for his experiments, Sarah and David learn along the way that there is a new strain of zombies, a faster, stronger and more intelligent version of what they are dealing with now. Through several twists and turns in the story we uncover the mysteries of the new strain of "super-zombies". Will David and Sarah have the moxy to destroy their new threat or will it destroy them both?? I love zombie books, they are one of my favourite genres to read. I love how Jesse brings current affair humour to the story...giggled over poor Mel Gibson being turned into a zombie on Day 4. I found Sarah unreasonably bull-headed during a time when caution should always be a factor, as well, I found her whiny, spoiled and dangerous to have around. I love David's quiet and forceful nature, a man who says what he means and means what he says and often left walking away shaking his head in consternation over the antics of his wife. I enjoyed the look into what life would be life if a zombie apocalypse did occur, the tent cities, everyone on edge, always looking over their shoulders and the suspicions that arise when everyone is in it for themselves. I cannot wait to read more...and my husband and oldest son both AGREE~!! The Zombie Apocalypse has been good to Sarah and David and they are starting a business. ZombieBusters-for all your zombie extermination needs. There are lots of zombies and that means lots of customers...Except one of them doesn't want the zombies dead, he wants them alive and ready for experimentation. Mad scientists make for difficult clients and this time, Sarah and David might have bitten off more than they can chew.